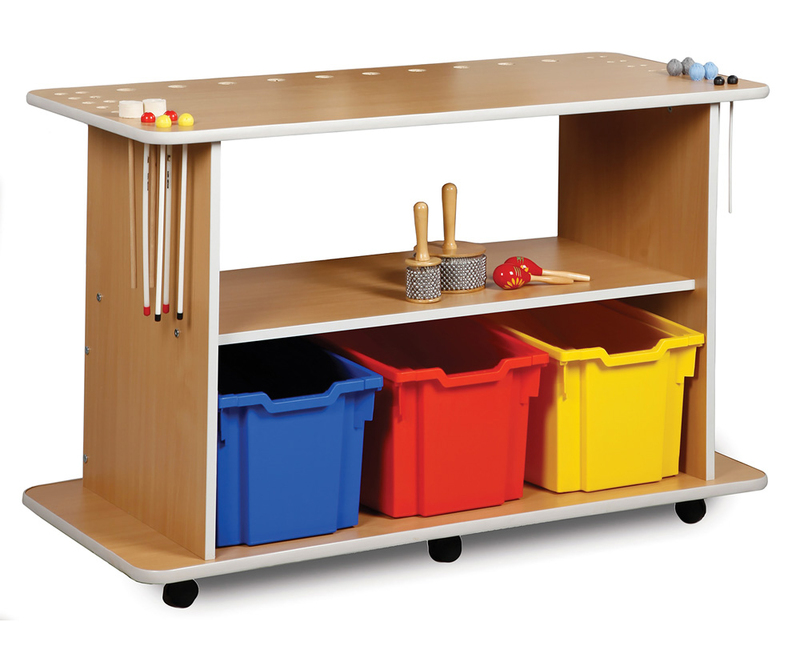 The musical instruments storage trolley is a fun and innovative storage trolley which is perfect for use in schools, pre-schools and nurseries. The mobile storage trolley is supplied in a modern beech finish. The solid top incorporates different sized recessed holes which are perfect for holding musical batons. The middle shelf is ideal for storing musical instruments and the unit comes with 3 extra deep Gratnells trays for additional storage. Trays are available in 16 eye catching colours. It’s a fun and easy way to store and transport your musical equipment within your learning environment. Complete with easy glide castor wheels for smooth mobility. Please note: multi-coloured trays are available at no extra cost. The musical instruments featured in product images are not included. Please Contact Us or call for more details on 01733 511121.